Purse seine is a common fishing method targeting small epipelagic species and it is exercised in several regions of the world, predominantly at night using light attraction (Ben-Yami, 1976; Acros and Oro, 2002). The method implies the use of lamp buoys (or rafts) equipped with light sources, which are powered by liquid fossil fuels like kerosene or liquefied petroleum gas, while in several cases fishermen use batteries and incandescent bulbs, or fluorescent lamps and lately LED lamps (McHenry et al., 2014; Mills et al., 2014). However, there is lack of common practices concerning light sources, intensities, light duration, light colors, etc. mainly due to high variability in the ecosystems and, consequently, the target species. As a consequence, the majority of fishermen tend to adapt traditional methodologies for the construction and use of their lamp rafts, or in other cases they use improvised light-producing floating devices. Until recently there were no commercially available light rafts, but during the last few years “FishingLedMaster” (http://www.fishingledmaster.com/), a small company which is specialized to the production of LED lights for fishery, design and produce lamp buoys for purse seine fishery (e.g. models PSL2 and PSL14). However, although a number of these products have been used by professional fishermen in real fishing conditions mainly in the eastern Mediterranean Sea, there is no scientific evaluation on their effectiveness in comparison to the traditional lamp rafts that are used by the majority of the Mediterranean fishermen (Adamidou, 2007). Kehayias et al. (2016) constructed a photovoltaic-battery- LED lamp raft which was built to be autonomous as the energy needs are concerned, and this device was tested in an inland aquatic ecosystem (Lake Trichonis, Greece). The present study comes additionally to the previous one and attempts to evaluate the technical performance and the operational effectiveness of a commercial LED lamp buoy (PSL2) on the attraction and consequently the catchment of fish in Lake Trichonis. Comparisons of the latter device to the autonomous photovoltaic-battery-LED lamp raft (APVR) proposed by Kehayias et al. (2016) and to the traditional lamp raft (TR), which is deployed by the fishermen for the purse seine fishery not only in Lake Trichonis but also in other marine areas of the eastern Mediterranean region, is attempted. At the same time, the present paper attempts to provide elements about the impact of the different light intensity and wavelength on the fish attraction utilizing the catch size of the target fish species in the lake. Lake Trichonis (38°18'-38°51' N, 21°01'-21°42' E) is the largest natural lake of Greece, with a surface area of nearly 100 km2. A population of Atherina boyeri (Risso, 1810) dominates the fish community of the lake and is the main source of fishing revenues (Leonardos, 2001). The fishery of A. boyeri is conducted by a few commercial fishing boats exercising the purse seine method mainly during the night in the period from late spring to early winter with the use of lamp rafts. The typical process of the purse seine operation in this lake (as well as in other coastal areas of the Mediterranean) involves the main vessel, a large rowing boat, and three lamp rafts that are anchored in certain sites to attract fish. When a dense aggregation of fish is formed, the main vessel encircles the fish school up to the point of the large rowing boat. Then it winches in the purse line, closing the bottom of the seine and forming a bag-shaped net that encloses the fish. Finally, the net is brought alongside the main vessel (Tsagarakis et al., 2012). For the purposes of this study, a number of purse seine fishing operations were conducted, with the use of a commercial LED buoy (PSL2), along with the APVR constructed by Kehayias et al. (2016) and a TR made by the local fishermen. The model PSL2 is a cylindrical buoy made from anodized aluminum and polyester (Figure 1A). It contains three 12V/18A deep discharge lead batteries which power two 20 W white LED spots producing a maximum light intensity of 2400 lumens by consuming 2.2 Ah (Table 1). The device is fully waterproof and unsinkable and it has the ability of wireless dimming control at three levels of light intensity. The total weight of PSL2 is 44 kg and its price is 2275 Euros. Figure 1: (A): The PSL2 buoy with the two white LED spots. Abbreviations given as: B: Flashing Beacon; CS: Charging Socket; MS: Main Switch, A, antenna. (B): The autonomous photovoltaic-battery-LED lamp raft (APVR). Abbreviations given as: PV: Photovoltaic Panel; B: Styrofoam box containing the electrical parts; St: Styrofoam Float; R: Reflector underneath of which is the LED lamp. (C): The traditional lamp raft (TR) with the battery (BAT) connected to the lamp. Table 1: Technical characteristics of the three lamp rafts used in Lake Trichonis. APVR is comprised from a cylindrical LED lamp, powered by a 12 V battery, which is charged by a 100 W photovoltaic (PV) panel (Figure 1B). It weighs 48 kg and the total cost for the construction and the purchasing of the individual parts reached 750 Euros. Details on the construction and the technical characteristics of APVR are given in Kehayias et al. (2016). Finally, TR is constructed from iron bars of 1 cm being arcwelded together in order to build a 105×80×20 cm (L×W×H) metal frame, on the base of which a thin iron or wooden panel is placed to hold a 12V/60A car lead battery. The battery is connected to a lamp frame projected 1 m above the water surface and consisted of three 8 W white LED lamps (1800 lumens). The whole construction floats upon plastic barrels hanged underneath the frame (Figure 1C). The total weight is approximately 45 kg and its total cost is estimated to about 200 Euros. Fishing was performed in two consecutive moonless nights every month between June and December 2014, except in June when there was only a single night of fishing. The three lamp buoys were anchored at a distance of about 200 m from each other with the cooperation of local professional fishermen. The latter performed purse seine fishing around them, starting usually about two hours before dawn. A 150 m net (height: 20 m, mesh size: 6 mm) was deployed around each lamp raft which had been stayed turned on for several hours (6-8 hours depending on the date). On board all the A. boyeri specimens from each catch were placed into wooden crates each of which contains approximately 10 kg and the number of these crates was used to estimate the total catch size of A. boyeri. Randomly selected fish samples were taken once every month on the first night of fishing starting from July 2014 and were placed in 31 plastic jars containing 10% formalin solution. In the laboratory, the total body length (TL) of all specimens was measured. Comparisons among the three lamp rafts concerning the catch sizes, as well as the lengths of the A. boyeri specimens caught around the rafts were performed using the non-parametric Kruskal-Wallis test and/or U-test. It must be pointed out that along with A. boyeri, small numbers of several other fish species, such as Tropidophoxinellus hellenicus (Stephanidis, 1971), Rutilus ylikiensis (Economidis, 1991), Scardinius acarnanicus (Economidis, 1991), Barbus albanicus (Steindachner, 1870), Silurus aristotelis (Garman, 1890), Cobitis trichonica (Stephanidis, 1974), Carassius gibelio (Bloch, 1782) and Anguilla anguilla (Linnaeus, 1758) were occasionally caught in the net. However, most of them were discarded from the catch due to their low economic value and they were not used in the estimations. Three series of laboratory measurements concerning the discharge rate of the batteries of each raft and the variation of light intensity of their LED lamps through time were conducted. The batteries on each lamp raft were fully charged and their LED lamps were turned on and stayed activated for at least eight hours, which is the common duration of their use during the fishing processes in Lake Trichonis. Voltage measurements were taken at every 20 min with a portable voltmeter. The light intensity (W/ m2) was measured in a specific spot at the surface of each lamp by a photometer (TES 1333 Solar Power Meters). The laboratory measurements of the batteries’ discharge rate for the three rafts, expressed as the decrease of their voltage during the 8 hours of their LED lamps’ operation, as well as the variation of the light intensity of the latter through time, are presented in Figure 2. The results showed the very good performance of the commercial model (PSL2), with the decrease of the batteries’ voltage being smoother than the other two lamp rafts. Indeed, there was no significant drop in its light intensity for at least a period of nearly 4 hours, which is an acceptable duration for deploying a lamp raft in the usual purse seine fishery conducted at sea (Adamidou, 2007). The final proportion of light being decreased in the PSL2 after 8 hours was 25.1-27.6%. On the other hand, TR had the worst performance and presented the greater decrease in its light intensity (30.1-31.8%), while APVR had the lowest proportion of light decrease among the three lamp rafts (17.3-18.6%). These differences are probably attributed to the variability in the type and the characteristics of the batteries of the three lamp rafts, all of which proved capable of producing light of high intensity for at least 8 hours. 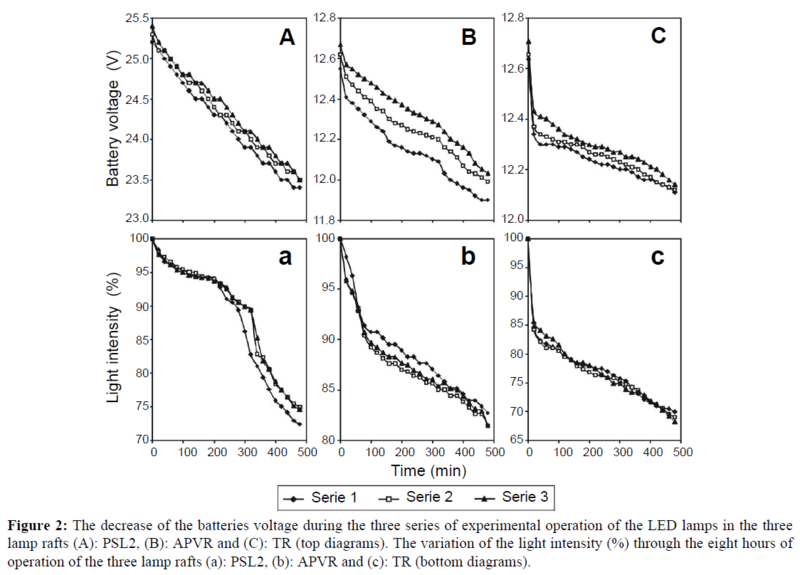 Figure 2: The decrease of the batteries voltage during the three series of experimental operation of the LED lamps in the three lamp rafts (A): PSL2, (B): APVR and (C): TR (top diagrams). The variation of the light intensity (%) through the eight hours of operation of the three lamp rafts (a): PSL2, (b): APVR and (c): TR (bottom diagrams). The three lamp rafts were used for a long period in harsh fishing conditions, though none of them presented any technical problems. The glass PV on top of APVR required some greater attention during launching and withdrawal of this raft which was performed by hand, but this was also the fact in the case of the upper parts of PSL2 (e.g. antenna, switches, beacon). The weights and dimensions of the three rafts were quite similar. The construction of TR was the simplest and the least expensive. Indeed, the total cost of 750 Euros of APVR was almost four times greater than of TR, but it was the one third of the cost of PSL2 (2275 Euros). Moreover, due to the presence of the PV there was no need for external charging of its battery using the domestic electricity or the boat’s engine, as the other two rafts required. Thus, in contrast to the zero operational cost of APVR, the use of the other two lamp rafts was substantial for the local fishermen as they have to charge their batteries every day by transferring them on shore and using the domestic power supply. The effectiveness evaluation of the three lamp rafts on the attraction of A. boyeri was based on weight comparisons of its catch sizes (Figure 3). Generally, the catch size variation taken by the use of the three lamp raft showed higher values between July to September, which is expected as it coincides with A. boyeri seasonal maximum of abundance (Leonardos, 2001; Doulka et al., 2013). The comparison showed that in all fishing dates the average catch size of A. boyeri taken by the use of APVR was considerably greater than of the other two lamp rafts (Kruskal- Wallis test, p=0.002). In particular, the (%) increase of the catch size achieved by APVR in comparison to PSL2 varied between 28.5% in July and 100.0 % in June, with an overall increase of 62.6%. Similarly, the respective increase of the catch size achieved by APVR in comparison to TR varied between 35.0% in July and 150.0% in June, with an overall increase of 66.3%. On the other hand, there were no statistically significant differences in the catch size between PSL2 and TR (U-test, p>0.05), though the light intensity of the former was 2400 instead of 1800 lumens of the latter. Moreover, the positioning of the LED spots of PSL2 close to the surface instead of in a hanging frame far above it as in the case of TR, prevent the loss of light which has been estimated to be as much as 50% (Ben-Yami, 1976). This means that the actual light intensity of TR was less than half of the respective value of PSL2, and verifies the suggestion of Kehayias et al. (2016) that it is the light color (or wavelength) and not the light intensity that affects the attraction of A. boyeri in Lake Trichonis probably through the greater attraction of zooplankton which is the main prey for this fish. Figure 3: The variation of the average A. boyeri’s catch size taken by the use of the three lamp rafts (PSL2, APVR and TR) from June to December 2014 in Lake Trichonis. Standard error (±) is given as vertical bars. The length measurements of A. boyeri specimens from the samples taken between July and December revealed some differences among the three lamp rafts. In July, the body length of the total number of specimens from the samples taken around APVR was greater in comparison to the other two lamp rafts (Kruskal-Wallis test, p=0.0001), while it was smaller in August (p=0.0001) and in October (p=0.0002). Νo differences among the three lamp rafts were found for the samples taken in November and December (Kruskal-Wallis test, p>0.05). The lack of apparent differences in the size of the A. boyeri specimens caught around the three lamp rafts means perhaps that a light source, either green or white and regardless of its intensity, attracts equally the various members of the population and does not give any clue about the reasons of the higher attraction of the green color. This points perhaps the need of a field investigation on the feeding habits of A. boyeri close to different light colors in order to explain these discrepancies. In conclusion, the overall evaluation of the three lamp rafts showed good technical elements as their durability and reliability is concerned. In addition, all devices proved capable of producing light of high intensity for at least 8 hours, which correspond to the usual operational duration of a lamp raft in Lake Trichonis, and it is certainly greater than the expected time for sea practices. Apart from these similarities each device presented certain advantages and handicaps. TR is easy to build and to maintain and it is the cheapest of the three. However, certain problems like corrosion of the (exposed) battery and electric shortcuts have been often reported by the fishermen. Also, the latter have to charge the battery of this raft (as well as of PSL2), which accounts for a considerable operational cost and inconvenience. Regardless the greater complexity and cost of APVR in comparison to TR, the former device can be constructed and maintained with low level of technological knowledge, while at the same time it was also proved durable in the field and it has the significant advantage of the zero operational cost. Moreover, due to the green light, APVR showed increased efficiency in the attraction of A. boyeri and produced greater catch sizes in comparison to PSL2 and TR. On the other hand, the commercial model PSL2, which was by far the most expensive, it has been designed and addressed mainly to the sea fishery, where the boats are larger and have the ability to charge the batteries through electric power from the boat’s engine. The present results on the higher catch sizes produced by the green LED light point the need for further field experimentation with the use of various light colors. PSL2 has the advantage that the manufacturer can equip it with two multicolored LED spots which can produce various colors. In this case, PSL2 could probably increase its performance, while it could become a valuable field instrument for investigating the affection of the different light wavelengths on the fish attraction. The authors wish to thank the fisherman Giorgos Zarkadas and his crew for their assistance in the field operations. Acros, J.M., Oro, D. (2002) Significance of nocturnal purse seine fisheries for seabirds: a case study off the Ebro Delta (NW Mediterranean). MarBiol141, 277-286. Adamidou, A. (2007) Commercial fishing gears and methods used in Hellas. In: Papaconstantinou, C., Zenetos, A., Vassilopoulou, V., Tserpes, G. (Eds. ), State of Hellenic fisheries, HCMR Publ., Athens 118-131. Ben-Yami, M. (1976) Fishing with Light.FAO fishing manual. Fish News Books Ltd, Surrey, England. Doulka, E., Kehayias, G., Chalkia, E., Leonardos I. (2013) Feeding strategies of Atherinaboyeri (Risso 1810) in a freshwater ecosystem. JApplIchthyol29, 200-207. Kehayias, G., Bouliopoulos, D., Chiotis, N., Koutra, P. (2016) A photovoltaic-battery-LED lamp raft design for purse seine fishery: application in a large Mediterranean lake. Fish Res177, 18-23. Leonardos, I.D. (2001) Ecology and exploitation pattern of a landlocked population of sand smelt, Atherinaboyeri (Risso 1810), in Trichonis Lake (western Greece). JApplIchthyol17, 262-266. McHenry, M.P., Doepel, D., Onyango, B.O., Opara, U.L. (2014) Small-scale portable photovoltaic battery-LED systems with submersible LED units to replace kerosene-based artisanal fishing lamps for sub-Saharan African lakes. RenewEnerg62, 276-84. Mills, E., Gengnagel, T., Wollburg, P. (2014) Solar-LED alternatives to fuel-based lighting for night fishing. Energy Sustain Dev21, 30-41. Tsagarakis, K., Vassilopoulou, V., Kallianiotis, A., Machias, A. (2012) Discards of the purse seine fishery targeting small pelagic fish in the eastern Mediterranean Sea. Sci Mar 76, 561-572.